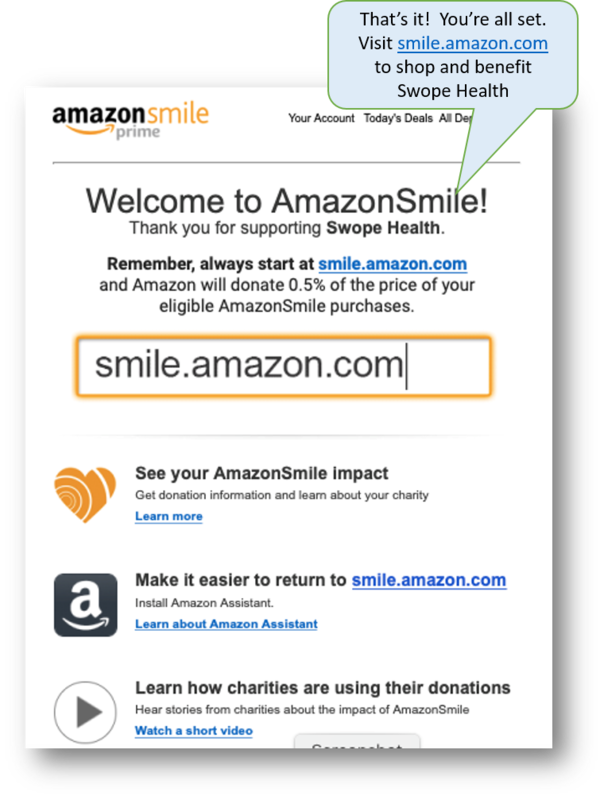 You are here: Home / Blog / General Information / Welcome to Swope Health’s Amazon Smile site! If you’re a fan of Amazon.com, you’re already aware of how easy it is to shop online and get your purchases delivered – quickly – right to your door. Now there’s a way you can support your shopping habit and Swope Health at the same time! It’s called Amazon Smile. 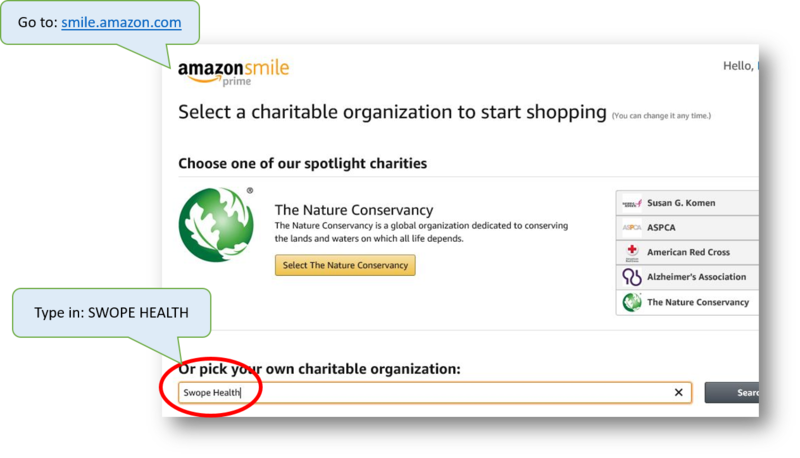 In this program, the AmazonSmile Foundation donates 0.5% of the purchase price of eligible products to a charitable organization. Swope Health has joined this program to raise funds for patients and to make it easier for shoppers to support programs like our Healthcare for the Homeless and Adult Community Psychiatric Rehabilitation Program (CPRP) Day programs. 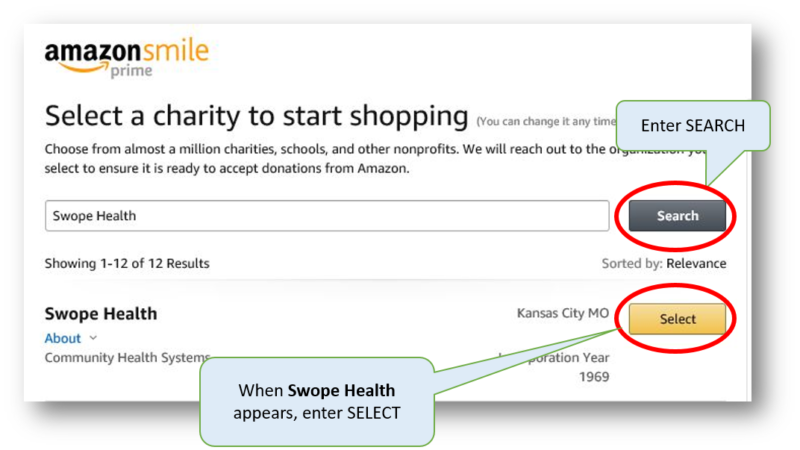 Amazon operates the Swope Health Smile site with the same products, prices, and shopping features as Amazon.com. You will see eligible products marked “Eligible for AmazonSmile donation” on product detail pages. Each request for a grant from the Patients in Need Fund is evaluated on a case-by-case basis. In the past we’ve helped with medications, eye glasses, bus passes, dentures and more. Homeless outreach – This page supports the Community Outreach Clinic and Swope Health’s Mobile Medical Unit (MMU), which visits homeless shelters throughout the metro area to provide healthcare. The Adult CPRC Day program – This page supports the program that focus on building life skills through topics like gardening, cooking and art. Supplies for these activities are always welcome. If you choose to purchase any items on these Wishlists, you can opt to have the items delivered directly to Swope Health. https://www.swopehealth.org/wp-content/uploads/2019/03/Amazon-4-featured.jpg 523 760 Swope Health http://www.swopehealth.org/wp-content/uploads/2018/11/swope-logo-rev-750.png Swope Health2019-03-25 06:00:312019-03-23 01:15:05Welcome to Swope Health's Amazon Smile site!